The mock-ups of the three iPhone 2018 in a video: disappointing design? Home News Apple Inc The mock-ups of the three iPhone 2018 in a video: disappointing design? 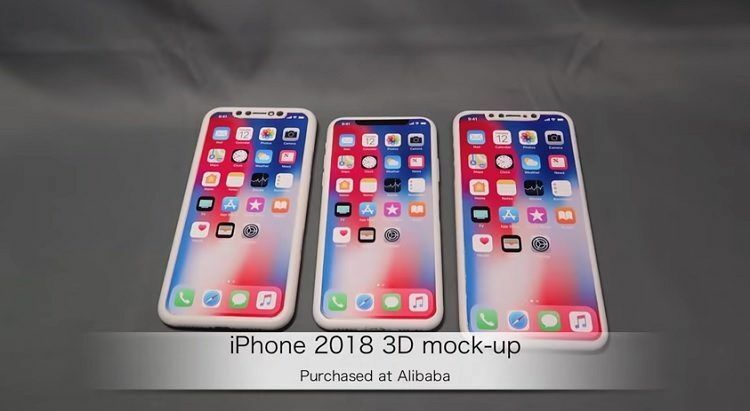 MacOtakara, a Japanese site that has always been considered one of the most reliable sources for the Apple world, has published an interesting video in which are portrayed the mock-ups of the three iPhone 2018, scheduled for September. And, as regards credibility, the Japanese site itself underlines how images are to be taken into great consideration: the models were created after receiving a series of “common” information from various Asian suppliers present in the production chain. The final result could vary but only for minor details: in fact, these images anticipate what we will see in the end of summer keynote. Obviously, there is no surprise in the lineup: the iPhone 2018 will be three, two of which with OLED display (are the 5.8 and 6.5-inch models), the other with a more classic LCD (with 6.1-inch diagonal) and cheaper. The latter should have dimensions equal to 150.91 x 75.72 x 8.47 mm and, as widely predicted, will be characterized by a greater thickness than the other two “iPhone”. The images also highlight a notch with dimensions that are anything but contained, reiterating once again that even the cheaper version of the iPhone 2018 will come with the True Depth Camera and, consequently, with the Face ID. The 5.8-inch iPhone with OLED display is considered as the true heir of the iPhone X. The video shows dimensions of 143.65 x 72.03 x 7.69 mm, which means that compared to the predecessor will be slightly wider. Beyond the fact that MacOtakara speaks of the discrepancy between the various sources, it seems clear that Apple has not predicted virtually any change in aesthetics compared to the “iPhone of the tenth anniversary”. We’ll see if it will be a risky move. And just like iPhone X even on the 6.5-inch model, with the OLED display, the notch will occupy a good portion of the top of the panel. All in spite of those who hoped that with the second generation of Face ID all the photographic module could see the size reduced significantly. By the way: this version would settle on dimensions equal to 157.53 x 77.4 x 7.85 mm, very similar to those of the iPhone 8 Plus.